To your dismay, the time has come when Swarthmore’s campus is once again talking about sports. The glorious few weeks since the Super Bowl that saw the student body sadly slump back into an academic slumber have come and gone. Now, talk of college basketball echoes through the halls of the Science Center. Words not native to your tongue like “Zion” and “Gonzaga” are shrieked as groups of students huddle around a laptop screen. Your sporty peers ask you how your bracket is “doing,” to which you respond with a nervous laugh and a prompt change of subject. March Madness is in full bloom here at Swarthmore, and I’m here to give you, the not-interested, uninformed, and too-busy student a couple of reasons to watch it. First, a brief synopsis of March Madness is needed. Essentially, the 68 best Division I college basketball teams from across the country play one another in a single-elimination tournament. There are four divisions that make up the bracket, each with sixteen seeded teams. Millions of people watch the tournament and attempt to make “brackets” that accurately predict the outcome of each matchup. Often, people gamble on brackets and individual games as well. Of course, no one ever predicts all of the matchups correctly, but some people do come very close. It is most often these people who are most vocal about March Madness, hoping to steer the conversation towards their bracket so they can humble-brag about how well it is doing. Currently, there are only four teams left who will play in the “Final Four” games this Saturday. Auburn University, a five seed, will play number one seeded University of Virginia at 6:09 p.m. and three seed Texas Tech faces off with two-seed Michigan State at 8:49 p.m. Chances are, as long as you don’t have a bracket with any of these teams remaining, you couldn’t really care less who wins. However, here are several arbitrary ways you can pick a favorite team out of these remaining four. This way, you can at least have one reason to scream and cheer for athletes go to schools you never even visited (except maybe UVA). A classic way to randomly choose a team to root for is by examining the mascots and picking the best one. The four mascots of the Final Four teams this year are the Tigers, the Cavaliers, the Red Raiders, and the Spartans. If you have a preference towards any of those characters, then perfect! That’s your team. Auburn are the Tigers, UVA are the Cavaliers, Texas Tech are the Raiders, and Michigan State are Spartans. Of course, this method is widely subjective and no one will be all too impressed if you root for Auburn because you like tigers. Another way to pick a favorite school is to establish some sort of personal connection with one of the Final Four teams. For example, if you have a friend that attends UVA and you care about their happiness, then perhaps UVA is the team for you! Conversely, if you wish to avoid the barrage of snapchats surely coming your way from a friend celebrating a UVA victory, then you may want to root for everyone except for the Cavaliers. If none of your friends attend any of these schools, perform a quick search of each school’s famous alumni to see if there’s anyone you like. You’d really be stretching for a “personal connection” at this point, but it’s better than nothing. If you’d prefer to root for the teams based on their road to Final Four, that’s perfectly fine too. UVA, after being the first No. 1 seed to lose to a No. 16 seed in last year’s tournament, has been on a revenge tour all tournament. They defeated No. 16 seed Gardner-Webb, No. 9 seed Oklahoma, and No. 12 seed Oregon relatively comfortably before facing No. 3 Purdue in the Elite Eight. Down two with 5.6 seconds left in the game and at the free throw line, Virginia deliberately missed the shot, grabbed the rebound, and managed to score a game-tying basket as time expired. They went on to win in overtime 80-75. Virginia are looking for redemption from last season and are in just their third ever Final Four. However, as a one-seed, they are hardly underdogs. Root for UVA if you like comeback stories and a safe bet. 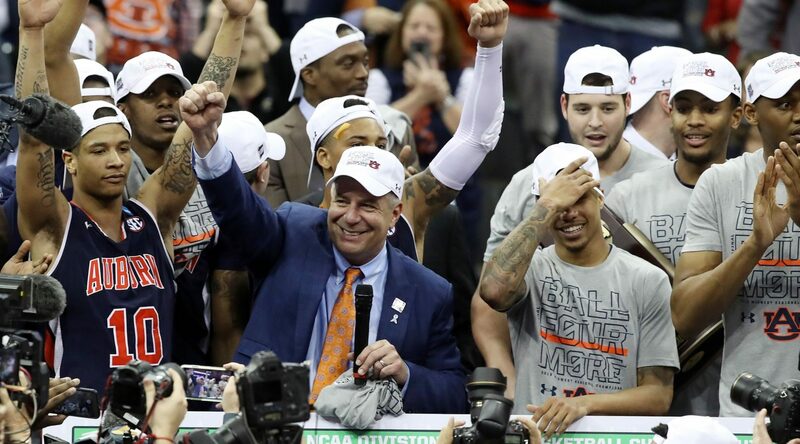 Auburn, UVA’s opponent, is the lowest seed left in the Final Four at No. 5. Auburn may be the hottest team coming into their Saturday matchup. After winning the S.E.C. conference tournament in stellar fashion, Auburn entered March Madness on a roll. They avoided a first round upset by narrowly defeating No. 12 New Mexico State in the first round, but then went on to beat No. 4 Kansas and No. 1 UNC in comfortable fashion. In the Elite Eight, Auburn bested No. 2 Kentucky 77-71 in overtime. Auburn, typically known to be a football school, is making their first ever Final Four appearance. Root for Auburn if you’re a fan of underdogs. Michigan State, despite being a two seed, may have pulled off the most surprising upset of the entire tournament in defeating highly favored No. 1 Duke last round. Duke was overwhelmingly the most popular choice to win the entire tournament. Led by freshman dunking sensation Zion Williamson, the Blue Devils were supposed to steamroll everyone on their way to a national title. However, star freshman R.J. Barrett missed a crucial free throw with Duke down two in the final seconds against Michigan St. and the tournament favorites subsequently crashed out. Michigan St. has flexed their muscles in every game thus far, beating No. 15 Bradley, No. 10 Minnesota, and No. 3 LSU fairly easily before taking down Duke. Michigan St. also had to deal with some side drama on their way to the Final Four. A video showing legendary head coach Tom Izzo screaming angrily at one of his players to the point where he needed to be calmed down went viral, and nearly everyone had an opinion on the matter. Some people expressed their displeasure at the coach’s treatment of his players, while others, mostly college athletes themselves, described how this “tough love” coaching philosophy works. No matter your opinion, you can’t deny that Izzo’s coaching approach works: this is the program’s eleventh appearance in the Final Four. If a consistent powerhouse sounds appealing to you, than root for Michigan State. The final remaining team and opponent of Michigan State, Texas Tech, were an overlooked No. 3 seed for a majority of the tournament. They quietly went about their business, beating No. 14 Northern Kentucky, No. 6 Buffalo, No. 2 Michigan, and No. 1 Gonzaga with relative ease. Texas Tech, like Auburn, is also making their first Final Four appearance. Despite playing great defense all tournament and never looking like they were going to lose, most predictions expect a strong Michigan St. to defeat them. Texas Tech are another underdog team to root for. Although this tournament did not feature as many upsets or buzzer-beaters early on, the matchups have really heated up as the games have went on. Saturday night will showcase the best college basketball has to offer, with two back-to-back games placing the four best teams in the country against one another. Even if you aren’t able to pick a favorite team to root for, the experience of watching college athletes leave everything on the court in the hopes of bringing glory to their school is always an unforgettable one. Don’t miss it. Joe '21 is from River Vale, NJ. Besides writing for the sports section of the Phoenix, he plays on the Swarthmore Men’s Soccer team and works in admissions as a tour guide.